So, with the festival coming to a dramatic close this evening with the festival fireworks it will be much quieter over the next few months, and life in Edinburgh will be returning to normal. That said, don’t get too sad, as there are still loads of great events and festivals over the next year to look forward to until August 2017 rolls round and gives us the usual plethora of festival delights ! 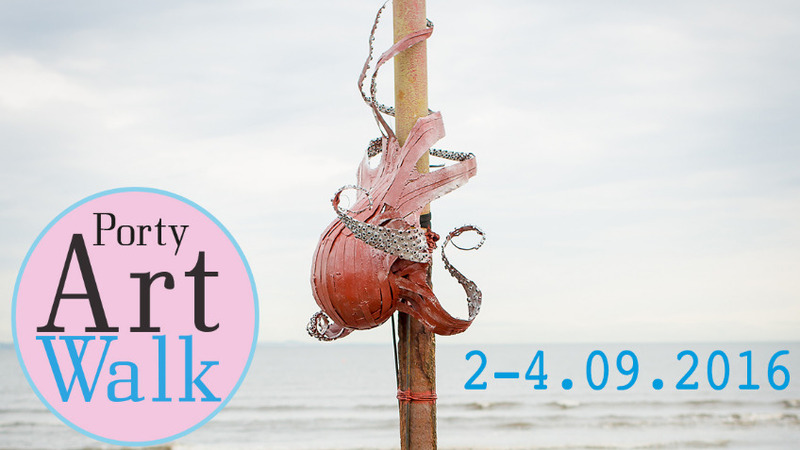 This coming weekend, the 2nd-4th September is starting us off with a bang and there are a host of fun things to be doing with the family…I’ll be posting about Epic Chalk Day 4 and the Family Aerial taster session later, but for now I wanted to tell you all about Art Walk Porty which is taking place this weekend, the 2nd-4th September in Portobello. In it’s second year now, the event builds on Portobello’s diverse creative community and its unique coastline with site specific art, artist open studios, popup art in local shops and venues,and a maker’s market, arranged around a local walk of Portobello. Showcasing quality contemporary art, supporting emergent artists as well as having an invited artists programme, and working with local shops and venues, and other public sites. The event engages the local community and wider audiences to a rich and diverse programme. This entry was posted in Free events and happenings, Uncategorized and tagged activities for children in edinburgh, aerial taster session out of the blue, art walk porty, epic chalk day 4 by Edinburghfestivalsforkids. Bookmark the permalink.